Anyone else soooo ready for the weekend? As if I weren’t already ready, this super yummy stir fry is giving me all the chill and cozy weekend feels. If you’ve been following me for a while you know that a stir fry is one of our go to meals— it can be entirely prepped ahead so that all that’s left is the 10-15 minutes of actual stir frying and they can be adapted to everyone’s tastes. The key is finding some good marinades and sauces and always switching them up! This almond butter marinade and sauce is one of my favorites and I hadn’t made it in a long time! The almond butter sauce is from The Minimalist Baker and is a dreamy blend of sesame oil, almond butter, gluten-free tamari, lime juice, maple syrup + a few squirts of sriracha. BEST flavor! A little savory, a little sweet & a little tangy . Here we paired it with simple stir fried peppers, eggplant and broccoli. The peppers and eggplant were stir fried with gluten-free tamari and some maple syrup; the broccoli is stir fried with just gluten-free tamari. The entire pairing of the almond butter sauce plus sweet and salty veggies is delicious! As you know if you’ve been following me a while, the rest of my family isn’t a huge fan of nut butter sauces of any kind so this recipe is great because the sauce is on the side. And they ate chicken instead of tofu which was just stir fried with sesame oil and tamari. Savory, with a little sweet and a little tangy, this simple veggie packed meal is bursting with flavor! The best part of a stir fry is that it can be mostly prepped ahead of time so that all that's left of the actual stir-frying and dinner can be on the table in 15 minutes! Almond Butter Sauce adapted from Minimalist Baker. In a small bowl or liquid measuring cup whisk together all sauce ingredients until well combined and smooth. Set aside. 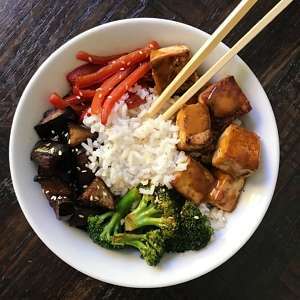 In a medium bowl, place tofu and gently mix with a few spoonfuls of almond butter sauce and let sit for about 5-10 minutes. Save extra sauce for serving. In a large skillet, over medium high heat, add 1 tablespoon oil and heat until shimmering but not burning, add broccoli. Saute for 1-2 minutes. Drizzle with 1 tablespoon gluten-free tamari and sesame seeds. Saute, stirring frequently for an additional 2-4 minutes until tender. I like my vegetables tender crisp; saute longer for softer vegetables. Set aside. In the same skillet, heat another tablespoon of oil until shimmering but not burning, add eggplant. Saute for 1-2 minutes. Drizzle with 1 tablespoon tamari, 1 tablespoon maple syrup and sesame seeds and sauté, stirring frequently an additional 2-3 minutes or until browned on all sides. Set aside. In the same pan, add 1 tablespoon oil, and when hot, add peppers, Sautee 1-2 minutes. Drizzle with 1 tablespoon tamari, 1 tablespoon maple syrup and sesame seeds and sauté, stirring frequently for 2-3 minutes or until crisp-tender. Cook longer for softer peppers. Set aside. 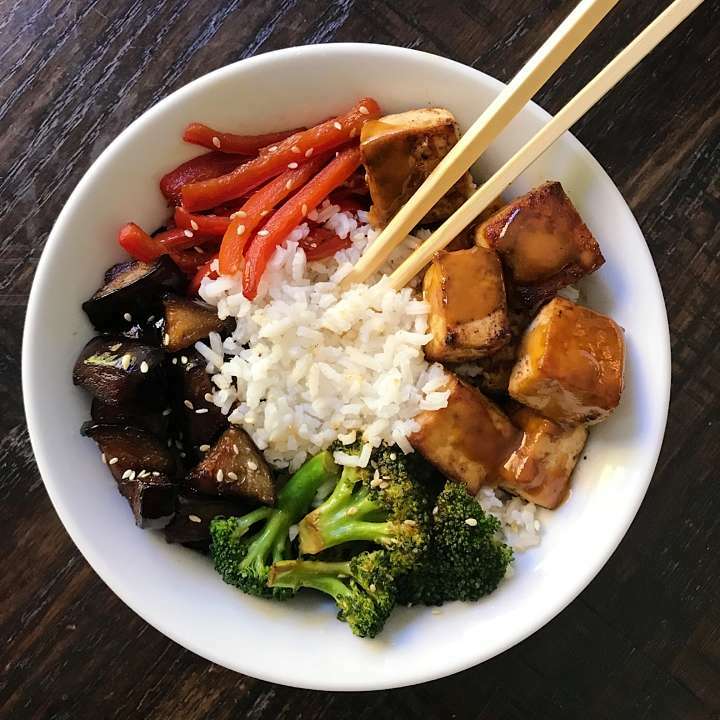 Place Rice in a bowl, along with eggplant, peppers,broccoli and tofu. Top tofu with additional almond butter sauce. Sprinkle veggies with sesame seeds for garnish if desired..